New York businesses and its employees alike can both benefit from learning the rules for NY tips, gratuities and mandatory service charges. First, let’s establish what is considered a “tip” or “gratuity” in New York. In its usual everyday meaning, a tip or gratuity is a voluntary payment over and above the charge for products or services (plus tax). Employers do not need to withhold additional funds for Social Security and Medicare (FICA) tax and can claim a credit against their own tax obligations for these amounts. The basic rule of tips is that they belong to the employee, not the employer. Tips and gratuities differ slightly from a “mandatory service charge” which some restaurants add on to bills for large tables, private parties, catered parties or special events. 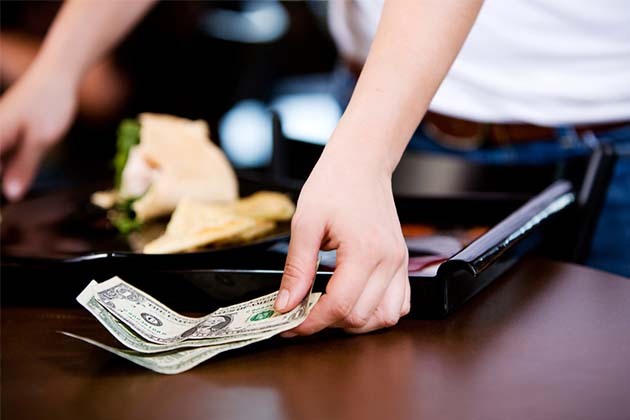 While some states consider this to be money owed to the employer, New York law establishes a rebuttable presumption that any charge in addition to charges for food, beverages, lodging, and so on, is a gratuity which must be distributed to employees. However, the tax treatment of those distributed as tips can be a burden on both employer and employee. Any portion of such a charge which the employer pays to employees must be treated as wages. This means the employer must withhold additional funds for FICA and may not claim any credit as it can for tips. Also, employers must include them as part of the employee’s hourly wage when determining overtime payments. The employer takes a tip credit. New York law allows employers to count all or part of an employee’s tips towards its minimum wage obligations. The credit is the amount the employer doesn’t have to pay towards the applicable minimum wage (which is the higher NY minimum wage). If an employee doesn’t make enough in tips during a given shift to earn at least the applicable minimum wage, the employer has to pay the difference. The amount of an applicable tip credit depends on the employer’s industry and the employee’s job duties, and employees must be informed of the tip credit in writing. The employee is part of a valid tip pool. Under both federal law and New York state law, employees can be required by their employer to pay part of their tips into a shared pool with other employees. Only employees who perform personal service to patrons as a principal part of their job may participate in the pool. All employees in the pool must contribute a portion of their tips that then gets divided among the employee pool. However, if the employer takes a tip credit, the employer counts only the tips the employee gets to take home up to the minimum wage limit as the credit. The employer may not keep any part of the pool or tip sharing arrangement – it all must be distributed to employees. Employees who have limited supervisory duties may participate in the pool if providing personal service to patrons is a regular or principal part of their duties. However, an employee who has meaningful authority or control over other employees may not take part in the pool.